Across each product included with the Pop Up Stand Bundles, there is the option to include your own personalised graphic design. If this is something you need help with, then we provide our own dedicated graphic design service. Our designers have extensive experience creating bespoke designs for organisations from a variety of industries. Whether you have an idea in mind or you are in need of a little bit of inspiration, with our graphic design service, we can create completely personalised graphic designs to help your exhibition stand to shine. Our pop up stand bundles are ideal when you are looking for a variety of marketing tools to promote your brand. 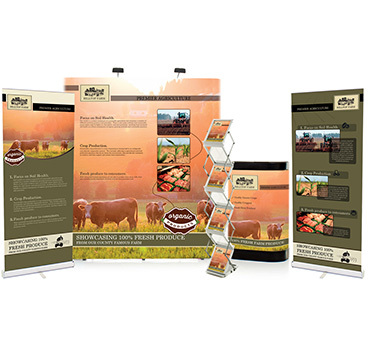 Rather than just a pop up stand, these bundles feature a collection of roller banners, leaflet dispensers and more. There are also a host of accessories which can be used to enhance your display. All pop up stand bundles manufactured by Go Displays are part of the Premier Pop Up Stand family and come complete with pop up stand frame, printed & laminated pop up stand graphics & wheeled pop up storage case. 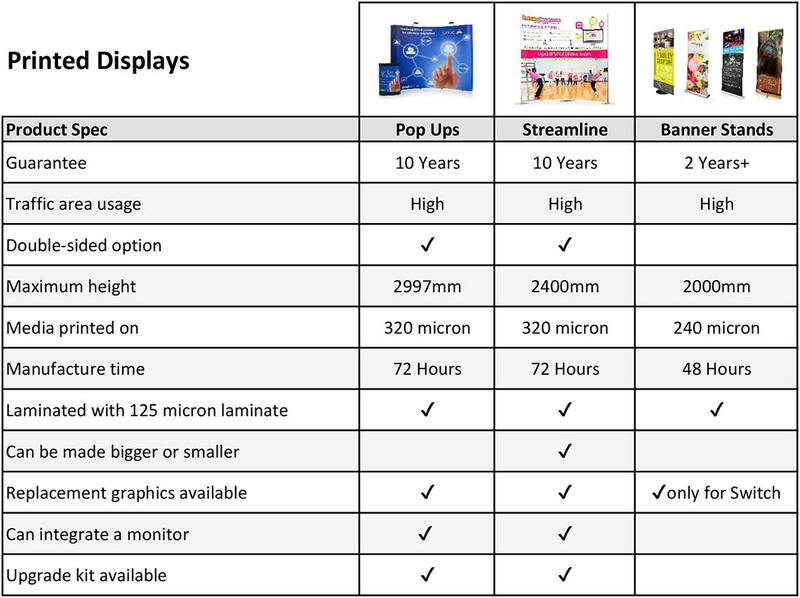 Why Buy a Pop up Stand Bundle from Go Displays? The design of each product included with the Pop Up Stand Bundles is aimed at creating an exhibition stand which is very easy to set up whilst having a high quality appearance to help your company to stand out from the competition. With a few simple step-by-step instructions, the Pop Up Stand can be assembled and ready for the show within a matter of 10-20 minutes. Each component features either a bag or a carry case which means they are easy to transport when you are travelling to different locations. Pop Up Stand Bundles are the most convenient way of creating complete exhibition stands without the hassle of designing your own. With a wide range of pre-designed exhibition stands, we have created a variety of ways in which to promote your brand and organisation at exhibitions. The key feature of our pop up stand bundles is that they are convenient to use and are manufactured to last for many exhibitions to come in the future. We achieve this by exclusively using high-quality materials which guarantee a fantastic array of products. While our pop up stand bundles are designed to provide the foundations of a successful exhibition stand, they may not be quite what you are looking for. If that is the case, then you can always give us a call on 01733 232000 or send an e-mail to sales@go-displays.co.uk and let us know what you require. Want help designing your Pop Up Stand Bundle? We have our own graphic design service here at Go Displays, so if you are looking to make the most of your pop up stand, then our experienced graphic designers can help to give you the edge. With each pop up stand bundle, we offer the option of our bundle graphic design service whereby one of our graphic designers will create artwork which spans each product included with the bundle. By opting for our graphic design service, you can let us know what type of design you would like, along with logos, pictures, text and colour choices. Then, one of our graphic designers will adapt this into stylish artwork which is fit for your pop up stand bundle. Within our graphic design department we also have an extensive image library that is available for anyone using our graphic design service, where you'll find a diverse selection of high resolution images. Therefore, we can guarantee to create a high-quality design if you choose to make the most of our graphic design service.